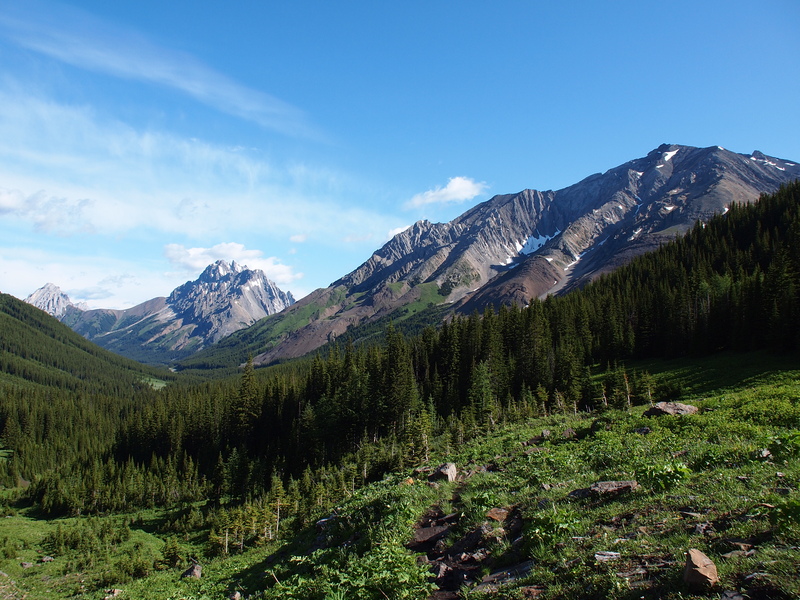 One of our favourite hiking destinations is the Highwood Pass area in Kananaskis Country. Located in the heart of Peter Lougheed Provincial Park, one of the jewels of the approximately 4,200 square km that make up Kananaskis Country, Highwood pass is the highest paved road in Canada, topping out at 2230 m. It’s closed from Dec 1 through June 15 each year, and since the first snow usually flies by early October, the hiking season in this area is fairly short. We selected Grizzly Col as our first hike of the year. 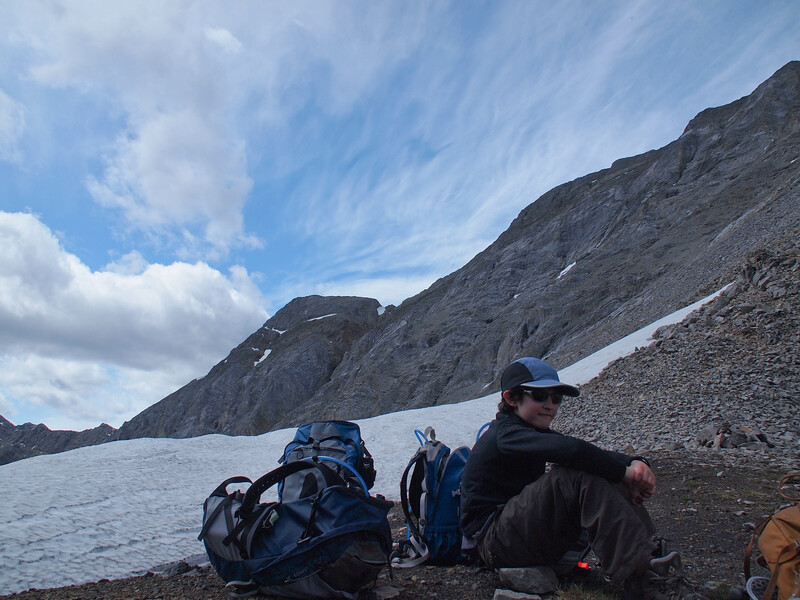 Approximately 10 km (return), with 600 meters elevation gain, it proved to be reasonably challenging for Oldest GeoKid’s friend, who was out for his first hiking experience in K-country. After about 10 minutes on level trails, the route cuts into the alpine forest and within another 5 minutes or so, you start climbing, first through an extended boggy section. With the late melt this year, we found the area to be even more muddy than usual, with extensive trail braiding caused by hikers seeking to keep their feet dry and boots mud-free. After reaching dry ground, and a bit of an up-and-down walk through the forest, you reach an open meadow approaching a wide talus field. 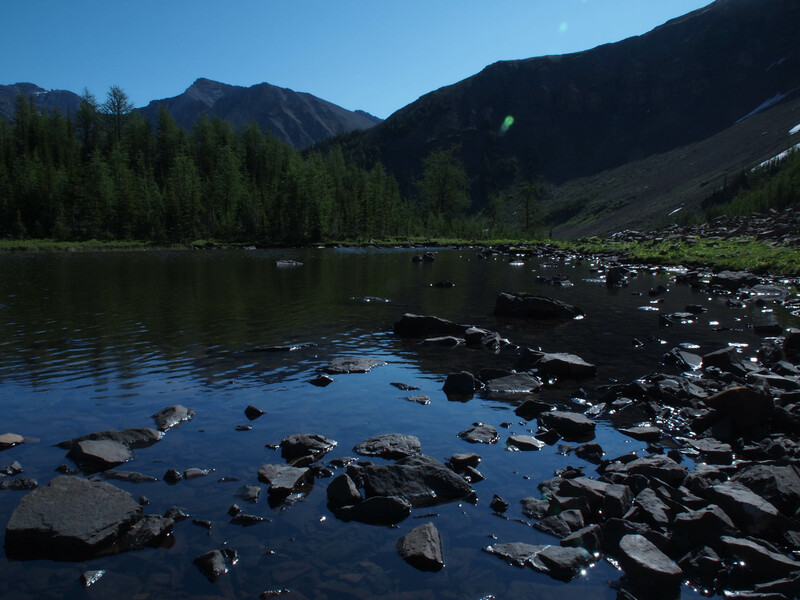 The talus field contains all the rock rubble off the Grizzly to Highwood Ridge section, and it’s inhabited by lots of energetic pika. If you sit still and watch the rocks, you will mostly likely spot their movements within just a few minutes. A wide range of wildflowers were in full bloom: alpine forget-me-nots, globeflowers, western spring beauties, golden violets, glacier lilies, crocus and more. 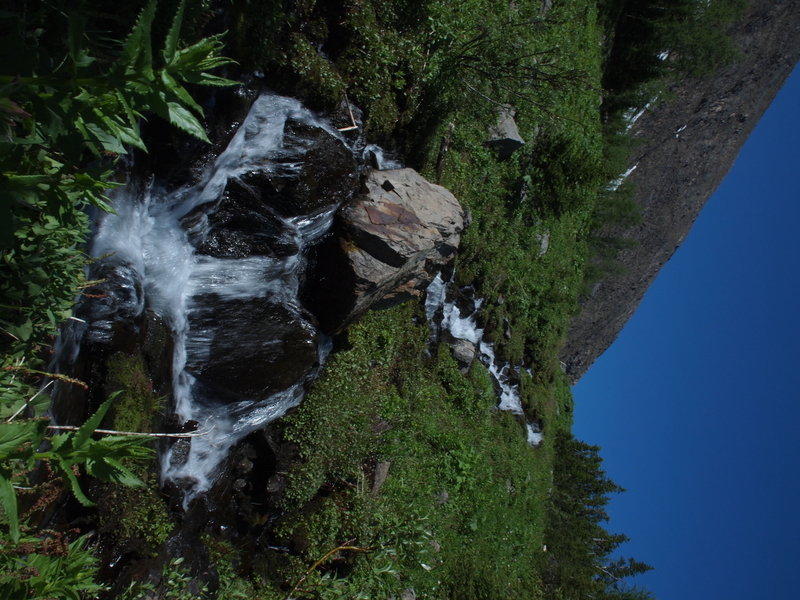 We took plenty of photographs, including several at the small falls and lake on the way to Pocaterra Cirque. We kept a watchful eye on the sky; the morning weather forecast called for heavy clouds and the possibility of a thunderstorm by early afternoon. Fortunately, we completed our climb (which included crossing several remnants of last winter’s snow pack) while the sky was still blue. 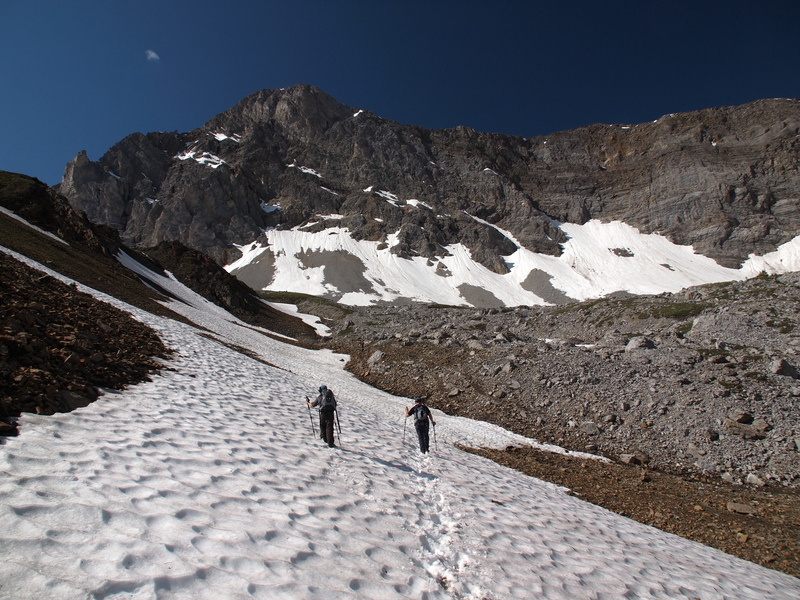 Youngest GeoKid and Mrs. GeoK rested at the saddle between Mount Tyrwhitt and Grizzly Col, while the rest of our group ascended to Grizzly Ridge to enjoy unobstructed views of the Elk Range, Mount Rae, Paradise Valley and the Kananaskis Valley. As a result, our larger group split up for the descent, with Mrs. GeoK and Youngest GeoKid leading the way. Oldest GeoKid quickly followed and we enjoyed some “downhill skiing” as we re-crossed the snow. 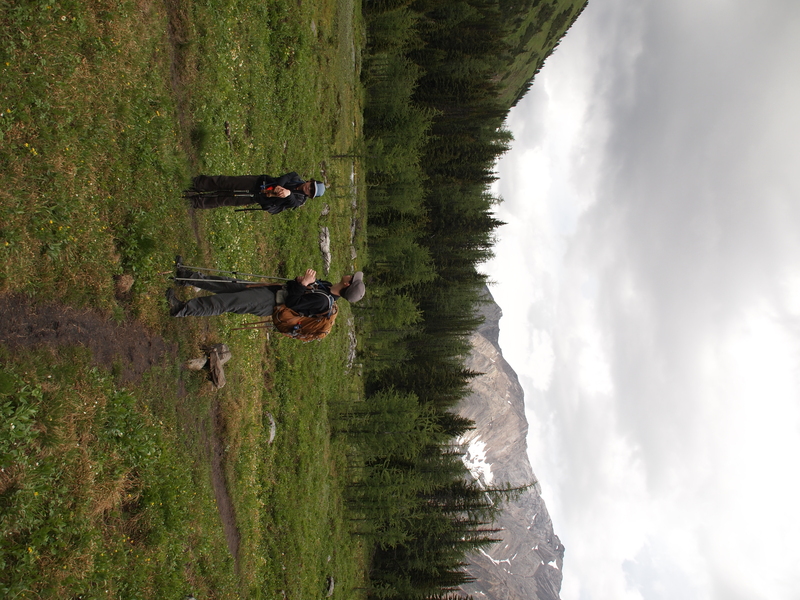 We had a bit of a wait in the wide meadow, near the marker cairn, while Oldest GeoKid’s friend made his first descent from a Kananaskis Ridge top (and very capably, too). Oldest GeoKid and his good buddy, along with Youngest GeoKid, led the rest of the way back to parking. In an effort to keep their feet dry, Oldest GeoKid and friend headed off on an alternate trail, which ended about a km north of the parking lot along Highway 40. As they walked beside the road, near the ditch, the rest of us re-crossed the boggy section, reaching the final meadow just as a few raindrops started to fall. Mrs. GeoK made a short detour onto the interpretive path, to gather the necessary information to log an earthcache: GC2CFE6 Nunatak at Highwood Pass, which was published about a year ago and has just 9 “found it” logs, including ours. There is one other traditional cache hidden near the Highwood Pass parking lot, plus 7 others (all our hides) on the trails up to Grizzly Col, Pocaterra Cirque, Pocaterra Ridge and the immediate surrounding area. 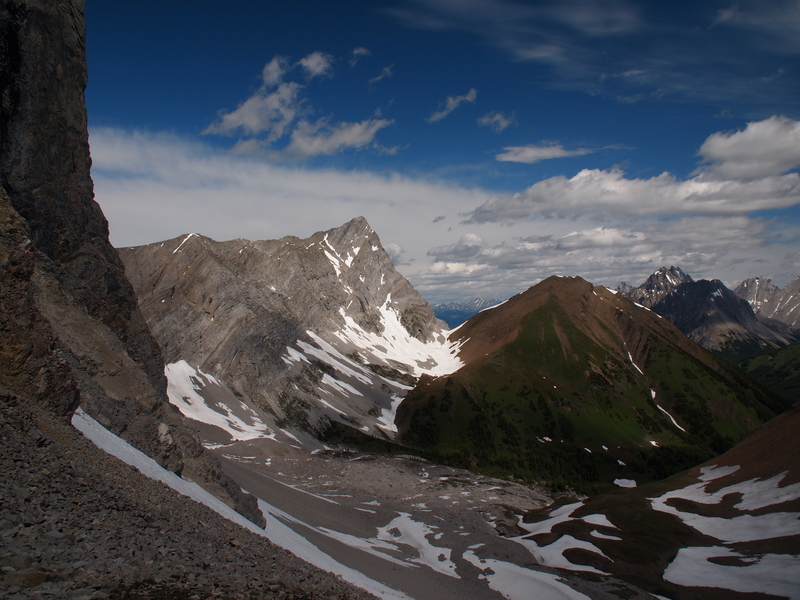 In fact, Grizzly Col makes our 10 favourite hikes list. 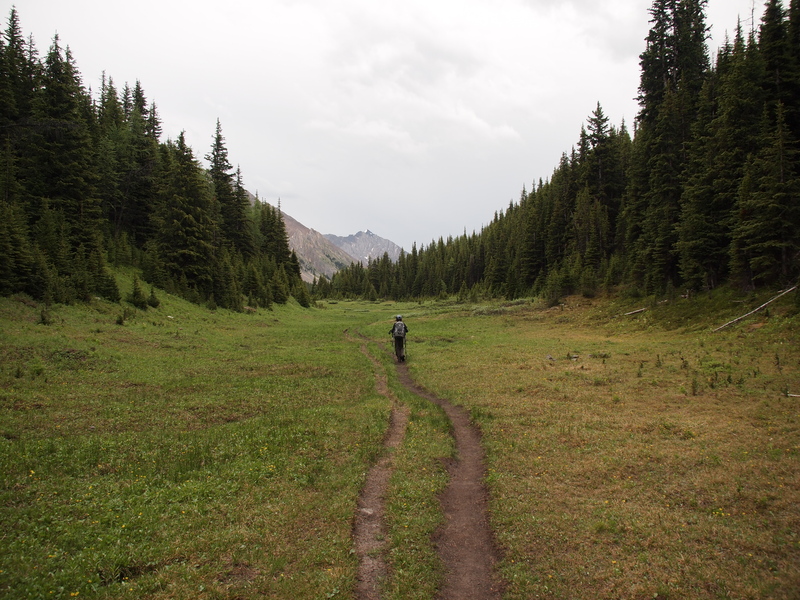 And while Oldest GeoKid’s friend isn’t keen to do this one again any time soon, he’s open to coming along to experience some more of our favourite hikes in beautiful Kananaskis Country.